Alpha Cook: It’s Not Easy Being Green…Or is it? I recently read a little quip on someone’s blog that said something like, “be nice to the Earth, it’s the only planet with chocolate.” And while that may remain officially unconfirmed, it did get me thinking—Earth is most definitely the only planet with bourbon…and scotch! So here are a few ways you can be more “green” in the kitchen, and do your part to preserve finely crafted whiskeys, benefit the environment, and appease Al Gore. I admit to struggling with trying to kick my select-a-size habit, but if we all just take baby steps… In addition to saving yourself money on those pricey rolls of Bounty, this choice can conserve water and cut back on paper waste that ends up in the landfill. And they can make your average dinner just seem fancier. Cut back on water how, you may ask? To produce one ton of white (bleached) paper towels, it takes about 20,000 gallons of water. As for those cloth napkins, you don’t even need to wash them after every meal unless you’re eating something particularly messy. 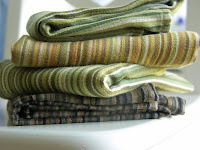 In our house they get a full day’s use and we throw them in the wash with the rest of the laundry. 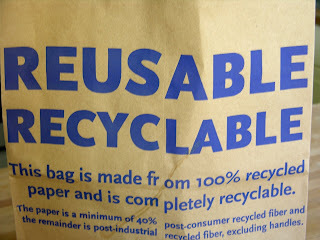 If you can’t give up your paper towels, but really wish you could, try recycled ones in place of your normal brand. And for cleaning, you might try cutting back on paper towels by buying a big pack of all purpose rags at Costco—they will probably last you a lifetime. The current throw-away consumer mentality just can’t get enough of the Swiffer. I admit to having the Wet Jet model in my house. I feel some shame. Though it’s handy for last minute, I-didn’t-have-a-chance-to-mop before-company-arrives cleaning, mostly it just moves dirt around on your fine linoleum. And it’s wasteful. Each time you mop or “sweep” you create unnecessary waste with those products. That’s why overall I prefer the good ol’ mop and bucket. But as an alternative, especially if you have wood floors in your house or kitchen, I highly recommend the one made by Method. It comes in biodegradable packaging, and the sweeper/duster refills are also biodegradable and can be composted. The wood polish smells like almond and makes the house smell good, too. 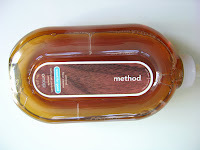 You can find Method products at Target. Get a few cents knocked off your grocery bill and save a tree or whatever. Almost every grocery store, from Trader Joe’s to Tops sells these reusable bags now now. Most of them don't cost more than a buck. If you can actually remember to bring them with you, you’ll really be in business. 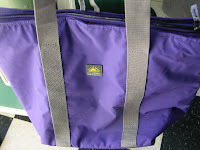 For extra points, a cooler bag like this one from Wegman’s keeps your cold stuff nice and cozy for the trip home. Stay tuned for more ways to go green in the future…next week I’ll extol the virtues of compost, Tupperware, and environmentally friendly cleaners. hearing you talk about mop and bucket made me teary eyed.